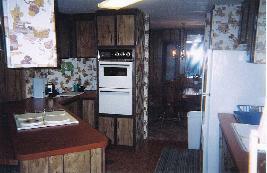 We have log cabins with open decks and some with covered porches. Some have combinations of both types and some offer gas log fireplaces. We offer one and two bedroom log cabins and two three bedroom modular homes. 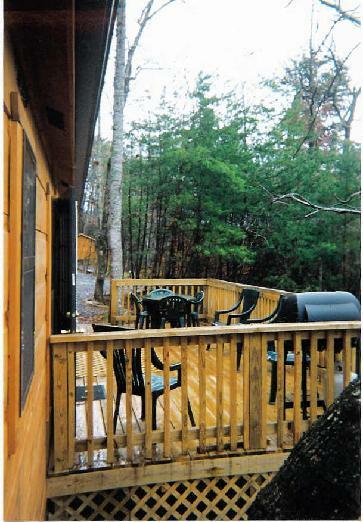 All of our cabins have gas BBQ grills on the porches. 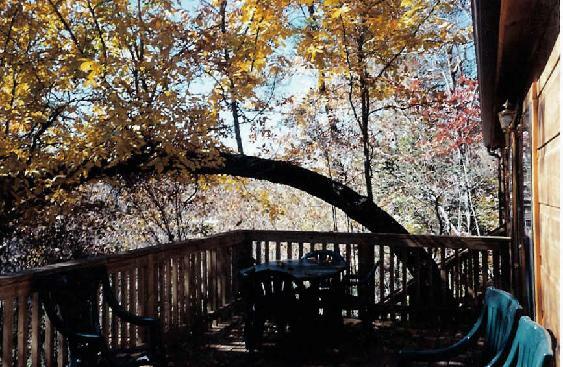 Rocking chairs, tables and chairs are offered on each cabin porch. 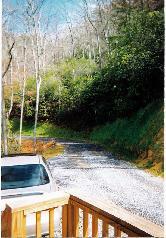 We have paved roads leading to our cabins and gravel drives around the cabins. Our cabins are in wooded setting. A modular home is available for larger families or several couples. We have a three bedroom modular home. It has two full baths and plenty of room. A fully equipped kitchen and dining room. A spacious living room with, large screen colortv, telephone. A large den or study area with color tv. A washer/dryer in the utility room. A 40' covered front porch with table and rocking chairs and gas grill. This home has all linens and towels provided. Heat and air conditioning, telephone and all cooking utensiles and table service for ten people. This home is spacious and clean. It's a perfect base while visiting our area. The rental rate for this home is lower than most hotel rates, no matter what time of year you're looking for. Call 828-497-6248. Like the large kitchen area. The bedrooms are large and have queenbeds, ample closet and storage space. The master bedroom has a private bath with a large garden tub and walk-in closet. 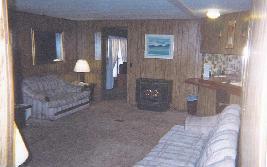 We are in the cabin rental business, but this is a very nice home with plenty of room. Copyright October 2015, Cherokee Cabin Rentals, all rights reserved.